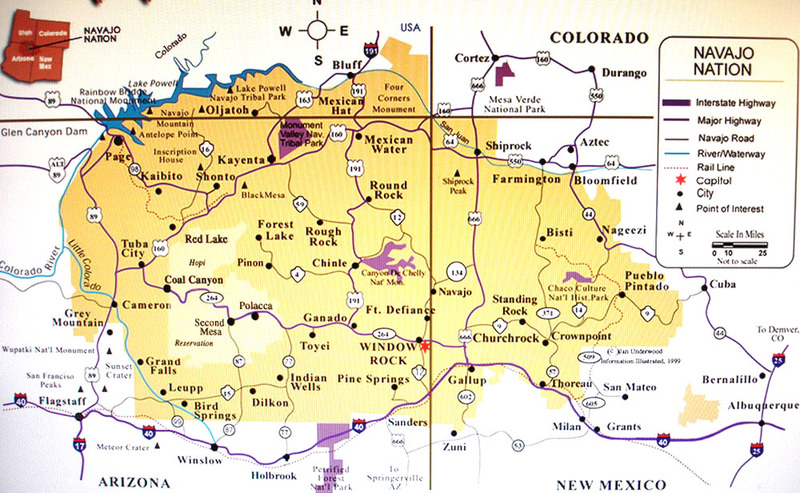 The Navajo nation covers land in Utah, Arizona and New Mexico, totaling more than 27,000 square miles. Their population exceeds 250,000, a majority of whom live within the nation’s borders. Their government is the largest among sovereign tribal nations, having 88 council delegates representing 110 chapters. Navajo traditions tell the story of the Emergence, in which First Man brought the four sacred mountains that mark the Navajo homeland into the Earth-Surface World. Anthropologists say that the Navajo split off from the Southern Athabaskans and migrated into the Southwest between 200 and 1300 A.D. They came into contact with the Spanish in the 16th century and many fell victim to the slave trade. Slave raids and massacres escalated and the Navajo were forced to move away from their traditional homeland. Conflicts became worse when the U.S. took New Mexico in 1846. The Navajo were forced to move constantly and eventually in 1863, the U.S. Army used “scorched earth” tactics to force their surrender. This lead to the 300 mile forced march, known as the Long Walk, to Fort Sumner in New Mexico. After four years of living in an overcrowded and unsanitary reservation, a treaty in 1868 allowed the Navajo to return to their original land, where they developed a barter economy. In the 1920s, oil and mineral exploration started, bringing wealth, as well as environmental problems, to the Navajo Nation and to Utah.